Jammin was was bred by Melanie Love. As with every success story, it’s all about what hands they end up in and Jammin was matched with her owner Karen Sutherlin and manager Bob Sweeney. Jammin first show ring debut was at the National Show Horse Finals as a yearling, where she was named National Champion Yearling Filly, it was a win that would set the mood for years to come. 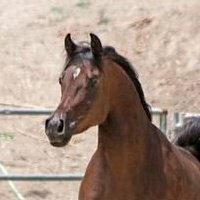 Partnered with Mr. Andy Sellman when he was at Cedar Ridge, they captured the titles of Scottsdale, Canadian and US National Champion H/A Saddle/Pleasure mare. Jammin was always successfully shown in Country Pleasure Driving taking top Honors at Scottsdale. After her success in the arena, Karen made the decisions to breed Jammin…and as they say, the rest is history! We are honored that Karen and Bob allowed us the opportunity to be a part of Jammin’s story and life and look forward to all the possibilities!